If you have a little one who is interested in competing in a beauty pageant, and you have agreed to let her do so, then you will have to get her some girls’ pageant dresses that are appropriate for the pageant she will be competing in. Girls of all ages compete in beauty pageants, and the rules for the gowns worn vary depending on the various age divisions of those competing. Generally, dresses for girls below the age of twelve (12) are more frilly and shorter. However, those competing in the older age divisions will be required to have a formal evening gown, which should always be floor length. Regardless of what age division your daughter falls in, there are a few tips that will help you out when choosing the right dresses for girls competing in pageants. Consider the Category/Event – Each dress purchased for a pageant should have a specific purpose in mind. For example, you don’t want to buy a gown just because you think it’s cute and will look adorable on your little one. You need to buy a dress with a specific competitive category in mind. Dresses for girls in pageants that aren’t purchased with a specific purpose (talent, evening wear, etc.) are a waste of money because they often don’t get worn. Overall Appearance – You and your daughter may love the look of mermaid gowns, but if your daughter is pear-shaped, then a ball gown is going to look much better on her. It’s important to remember that the overall appearance of the dress is much more important than the particular style. The dress should complement the natural shape of your daughter’s body. Another quick tip for older competitors is that they can easily create the illusion of an hourglass figure if they choose the right dress for their body type. Don’t Forget Color – It’s important that you choose dresses for girls in competitive pageants carefully and consider the colors. Make sure that the girls’ dresses your little one wears not only complements her skin-tone but also her hair color, nails and the season it is to be worn in. Price Doesn’t Really Matter – A common misconception that many parents new to pageants have is that the dresses for girls in pageants are always expensive. The truth is that it doesn’t matter if you buy the dress at full price or order it online for half-price, as long as it is appropriate and complements your daughter (in all aspects) it will work! We have all worn a piece of clothing before that has had some sort of clothing malfunction during the time we’ve been wearing it. For the most part, these malfunctions are small inconveniences that make us feel uncomfortable and make the piece of clothing not pleasurable to wear. Often times, these seemingly complex issues can be fixed rather quickly, when you know what to do. Below are quick fixes for some of the most common fashion problems. Gapping of Dress Shirts – There are a few ways to fix this problem, it just depends on what you have available to fix it with when it occurs. If you are out and about and notice your blouse gapping, you can easily fix it with a safety pin and no one will notice. However, if you don’t have a safety pin available, you can temporarily fix it with an earring by using the earring and its back like a safety pin. Once you get home, you can permanently fix the problem by attaching a small piece of Velcro on the inside of the shirt in the problem area. Zipper Problems – The two most common types of problems regarding zippers are when, 1) the zipper won’t glide easily, and 2) when the zipper loses traction and doesn’t stay up. The good news is that there is a solution for each of these issues. Zipper Doesn’t Glide Easily: To fix this problem, simply take two strips of masking tape and put one piece on each side of the zipper to protect the material. Then, get some WD-40 and spray on the zipper itself. You’ll find that the non-gliding zipper will move easily now. Zipper problems, boys shirt and pants outfit, belt problems, collar gapping, boys dress belts, common fashion problems: Okay, so to fix this issue, you will line both sides of the zipper with masking tape, just like for the above zipper problem. Then you will spray the zipper with hairspray that contains lacquer. This will give the zipper the resistance it needs to stay up while you’re wearing it. Belts – Oh, the joy of belts. Not only do they serve a purpose for holding our pants up, but they also make great accessories too! More than likely, you’ve purchased a belt before that quickly became one of your favorites, but for some reason or another it became too tight and uncomfortable to wear. You can fix this problem by taking a knife or other sharp and pointy object and puncturing a hole at the end of the belt so it will fit looser. On the flip side, if you have a belt that is too loose, poke a hole in at the opposite end of the belt to make it tighter. For many around the country, today is a significant day for parents. Why? It’s the last day of school until January, marking the beginning of our children’s Christmas Break. Why is this a significant event? It’s a day that many parents dread because they have no idea what they are going to do to keep their kiddos busy for two entire weeks. (Some schools are even out for three this year!) If you are one of these parents, don’t freak out. We’ve got some fun ideas for activities you can do with your kids over Christmas Break. Have a Gingerbread House Making Contest – If you have grade-school age children and older, then hosting a gingerbread house making contest is a great way to keep them occupied for the day. Of course, you can’t go buy a kit at the grocery store and expect the kids to be entertained for hours. No, they’ve got to make them by scratch in order for this to be an all-day activity. If you’ve never made a gingerbread house from scratch before, you can do a search in Google and find the instructions, recipes and patterns you need. If you and your children have made gingerbread houses from scratch before, then you will probably be able to leave them alone (checking on them periodically is recommended) once they get the pieces in the oven. Baking and building gingerbread houses is not only a lot of fun, but it gives kids something constructive to do with their time over Christmas Break. Have a Fashion Show – If you are the parent of one or more young girls, then helping them put on a small fashion show is a great way for them to spend an afternoon. This is especially fun for a group of girls to do. Additionally, it’s a great way for your girls to get some extra usage out of all those formal dresses they have in their closets! Volunteer – One of the best ways to get your kids in the Christmas spirit while keeping them busy during their Christmas Break is to get them involved in volunteer work. Perhaps you are close to a local food bank that serves meals to the homeless during the day or there’s a nearby nursing home that will allow your kids to come in and sing for 30 minutes? Those are just a couple of examples of places your children can volunteer their time for a good cause, there are many more. Just look in the phone book for more ideas. Get Out and Have Fun – Many parents prefer to keep their kids at home for the majority of Christmas Break, but this can just lead to bored and restless children. So, why not consider going out for at least an hour each day (or every other day) over break with your kids? A few things you can do include: going ice skating, watch a movie, go bowling, take the dogs on a walk, get hot chocolate or a mocha at a nearby coffee shop, etc. Just getting the kids out of the house for an hour will help burn off some of the extra energy they have. As you know, Christmas is this Sunday! While many people don’t consider 3-4 days as “last minute,” I know I get a little stressed if I don’t get my shopping done before the week before Christmas. There’s just so much to do the week before Christmas excluding more shopping. However, does this mean that I haven’t ever got behind and had to shop for my Christmas gifts a few days before Christmas? No, believe me, I’ve been there! If you are running behind this year and still have some more gifts to buy before Sunday, then you may find some of the last minute Christmas shopping tips helpful. Take a Vacation Day – If you have some extra vacation days lined up, then consider asking your boss to take one off (perhaps, this Friday) so you can get your last minute shopping done. Most employers don’t mind if the employee has time available to take off. Make a List – There have been times when I only had a few things left to buy for Christmas and thought I could remember who I was shopping for, but once I got in the store, I forgot and ended up buying more gifts than I needed. Learn from my mistake and make a list of all the Christmas gifts you have and who they go to. Then, make a “Gifts Left to Buy” list to take with you when you hit the stores. Go Early or Late – There’s no question about it, the stores will get busier with each day leading up to Christmas. However, most of the crowds don’t get to the store until noon (lunch break) and in the afternoon (after 3:00 p.m.). Therefore, if you get up early in the morning and shop before noon, you’ll find the stores are easier to navigate through. This is also true for late at night. It’s Not Too Late for Online Shopping – It’s currently not too late for ordering a few last minute Christmas gifts online. However, you will have to pay for it. In order to get your gifts here in time for Christmas, you’ll have to pay for 1 or 2-day shipping, which will cost more. While no one enjoys getting out and battling the crowds for last minute Christmas shopping, sometimes it’s necessary. And, sometimes it pays to wait ‘til the last minute. 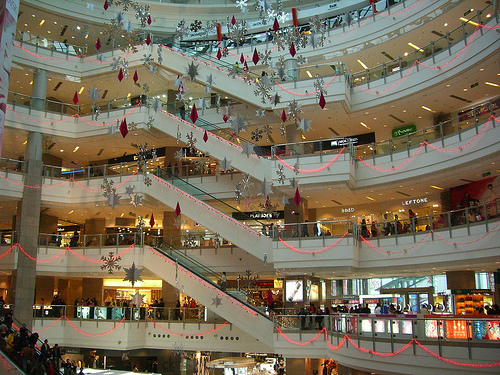 For instance, most stores hold sales the day or two before Christmas – especially clothing stores. Therefore, if you’ve got to get a Christmas dress for your little girl to wear to church on Sunday, then heading to a department store on Christmas Eve may be a great thing to do! With the holiday season upon us, we are currently in the middle of winter and will stay here until Spring arrives. While many of us prefer to spend cold winter days snuggled up inside by the fire, life must go on and for many parents, this means at least one birthday party will take place during the winter months. Hot Chocolate/Tea Social: Young girls love to play dress up, and it’s even more fun when they have somewhere to go! If you have a young daughter (5-7) who is a “girlie-girl” and loves getting all dressed up to go out, then she will love the idea of a having a formal hot chocolate/tea social for her birthday party. Depending on how many guests you are expecting, you will probably only need 2-3 tables. Make sure each table is covered with a formal-looking table cloth and each place setting has a small dessert plate with a saucer and matching tea cup. (You’ll need silverware also). Announce in the invitation that attendees are to come in formal attire. At the party, you can either serve the girls or show them how to make their own hot chocolate/tea. The tea cups and saucers will make great party favors for the girls to take home. Ice Skating Party: Another great wintertime birthday idea for girls is an ice skating party. More than likely, you’ve got an ice skating rink within a couple hours from your house. All you have to do to make this party a hit is to call and book your party, requesting a small room for the cake and ice-cream (if they have one available), send out invitations and take the birthday girl and her guests to the rink once they arrive. S’mores Slumber Party: Finally, as you know, girls love to chatter amongst themselves (no matter how old they are). This is why slumber parties such a success with young girls. They get to spend the night with each other’s company and stay up talking for as long as they like. During the winter months, it can be fun for the girls to have a s’mores slumber party where they roast marshmallows in the fireplace and make s’mores while talking. If you don’t have a fireplace, that’s okay, a microwave will work just as well! Brought to you by Kids Formal – Fine Children’s Formal Wear Since 1988.